**Session 4 is 9 weeks long, we are closed the week of New Kent's Spring Break. **We have an open enrollment policy-you can sign up at ANY TIME and be prorated for what you have missed. We have new students every week! Tuition adjustments will be made after you register. **You can choose to do a single 8 week session or ongoing monthly membership. **Pick your class below, any discounts will be applied after you register. Your card will be run with the registration fee within 48 hours unless you note otherwise. **The Intermediate and Advanced level classes on the schedule are invitation only, based on skills acquired. 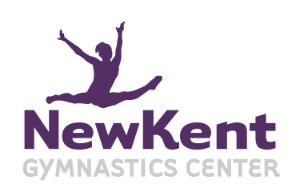 New students can get an evaluation from a New Kent Gymnastics coach for class placement if they have had previous experience. If you prefer an ongoing monthly-select your class AND scroll all the way down and select the Gold Pass too! We will adjust your account, please note if you would like the 1st or the 15th draft date. Gold Pass is a year commitment...with perks!! See more on our Policies page.